The British Britannia 1-ounce gold coin is a stunning British coin that looks amazing in any collection and that will be a brilliant investment choice. There are a lot of great reasons to consider this gold coin for your next investment and in this detailed post, we’ll be looking at why it’s such a smart buy and a at a little of its history. Britannia is one of the oldest coin icons in the world and is a classic design that is well known across the world. It represents beauty, reliability and strength and this particular, iconic design, was created by Philip Nathan. The classic depiction of Britannia has been appearing on coins dating all the way back to the Roman era, when it was found on Roman bronze coins in the 1st Century AD. It is said that the figure herself is modeled on Frances Teresa Stuart, the future Duchess of Richmond at the time, who was infamous for refusing to be the mistress of Charles II (who was reportedly infatuated with her). Britannia would then be printed on the British halfpenny coin during the 17th century and this continued until 1936. Since then, she has gone on to appear on pennies between 1797 and 1970, on 50 pence coins between 1969 and 2008. In spring of 2008, the Royal Mint introduced new coin designs that omitted the image of Britannia to reflect a ‘more modern 21st century Britain’. This was a highly controversial decision that upset many and it is something that can be seen as an omission. However, she would continue to appear on gold and silver bullion coins issued annually by the Royal Mint, including this British Britannia 1-ounce gold coin. On this coin, Britannia stands with her famous shield and a trident, with hair and dress looking windswept as she gazes off into the middle distance. It evokes the sense of standing at the edge of a shore, perhaps alluding to Britain’s one-time naval supremacy. On the reverse is a very classic image of Queen Elizabeth II, which in this instance is a depiction by Jody Clark. 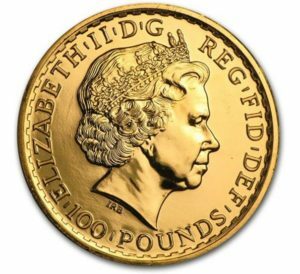 The British Britannia 1-ounce gold coin is the most popular large coin for private investors in the UK but has a global appeal thanks to its guaranteed weight and quality and the repute of the Royal Mint. These coins are produced to bullion specifications, meaning a standard finish to circulating coins. The coins are sold at a slight premium over the metal price and many will buy them based purely on the intrinsic value as investment-grade precious metals. The Britannia can also be found in proof and brilliant un-circulated finishes, as well as collectible versions. The coins are struck in 999.9 fine gold and can be purchased in 1 oz, ½ oz, ¼ oz and 1/10 oz pieces. All of these coins can be purchased with protective packaging such as the common tubes that make storage and delivery that much easier. These coins are highly popular thanks to their intrinsic value and guaranteed quality, as well as their historical interest, their ready availability and the stunning design which is particularly dramatic and dynamic. 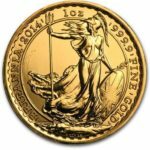 Why Invest in The Britannia Gold Coin? If you’re thinking of investing in gold, then British Britannia 1-ounce gold coin is a great choice that will make a great investment. It will hold its value, provide a beautiful collectors piece and be easily to buy and sell. Right now is a perfect time to start investing in gold. While the economy is struggling and the future is uncertain, it is a good time to put money into ‘low risk’ assets. Gold is such a low-risk choice, thanks to its scarcity and its intrinsic value. There is simply not that much gold in the world and that means that even when the value of money fluctuates, gold will always be valuable. Its value usually increases slowly over time – even during a recession. And when the value of gold does fall, it’s almost always a temporary thing and sure to return after a short while. This is an investment opportunity that is inflation proof too. The big advantage of buying cold coin in particular, is that it allows physical ownership of the gold (called ‘direct ownership’ in the industry). Unlike investing in assets, or even gold bars, this means you actually get to keep the asset you’ve bought and hold it in your hand. There are no fees associated with maintaining an account or storing your assets and there is no fee for withdrawing what you’ve bought. This is a rare case of an investment that you actually feel as though you own! And that means that even after the zombie apocalypse, you’ll still have your gold coins and they will still hold their value!